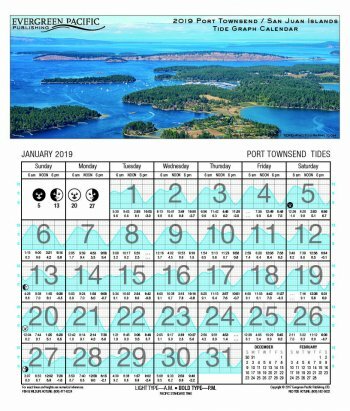 The best choice for the San Juans, this calendar provides Port Townsend monthly tide graphs, with heights and times. Also included are Deception Pass and Tacoma Narrows current tables, a tide correction table for 49 different locations, tide tables for the Pacific Beaches, moon phases, a sunrise/sunset table, and emergency-use recompression chambers for the Pacific Northwest. This fourteen month calendar begins with November 2018.